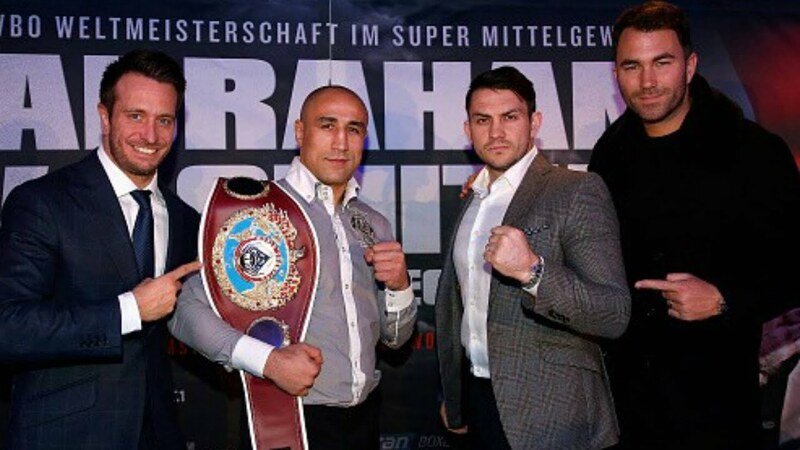 The highly anticipated rematch between Arthur Abraham and Paul Smith will occur this Saturday night from the O2 World Arena in Berlin, Germany. Abraham was the bestowed winner by unanimous decision in the first match, his controversial win further embellished by what many felt were preposterous scorecards in his favor that would lead a non-observer to believe the fight was not competitive. Smith appeared to be the superior technical boxer in their first match, outworking Abraham, while Abraham's power made him a threat throughout the fight. Stylistically, the rematch should be more of the same, though the outcome would seem to all depend on Abraham. For Smith is unlikely to score a knockout here and will need to duplicate his performance from the previous bout. On the other hand, Abraham can decide when he wants to commit to offense. While Abraham has the reputation of being a “slow starter,” this is misleading. His approach ts the same for all twelve rounds. In the beginning of a match, his opponent is always fresh, willing to throw punches, forcing Abraham into his infamous high-guard defense which is actually very dysfunctional. Carl Froch was having his way with Abraham to such an extent that he occasionally threw rear uppercuts from distance to pierce the gloves of Abraham's high-guard, but only because he knew Abraham was out of position to counter. The high-guard, “peek-a-boo”, defense of Abraham involves him positioning his hands so high, with his elbows and forearms held close to shield his face, that it is mechanically inefficient for him to throw any punches at all - that is, without first lowering and splaying his arms, i.e. “cocking”, to load on a punch - while leaving him open to body attacks. Further, his version of the high-guard position is sure to block his peripheral vision against a fighter who uses lateral movement. Finally, in regards to his stance, Abraham's momentum is strictly forwards and backwards – that is, he lacks the footwork to keep in front of a boxer using lateral movement, demonstrated by the difference in success that Abraham had between Carl Froch and Jermain Taylor. Froch relied on consistent lateral and circular movement, whereas Taylor was fairly stationary and tended to move backwards to invite the forward momentum of Abraham. The tendency of fighters to be able to duck underneath Abraham's punches can also be attributed to his high-guard as well as his upright stance. When Abraham wants to be offensive, he keeps his hands low, thereby relying solely on head and leg movement for defense, neither of which he uses. By this time, however, Abraham's opponent is less active due to fatigue. Thus, will Abraham be willing to absorb Smith's punches early in order to land his own – how much does he respect Smith's power? - or will he fall behind on points using his high-guard defense hoping that Smith tires out late? If Abraham chooses to neglect his defense to be more offensive, Smith will need to improve his lateral movement to avoid punches. For it is quite likely that a more aggressive Abraham would have knocked out Smith in the first match since Smith's defense was really his good lead offense. Indeed, the only moments of success for Abraham came when Smith was less active, owing to fatigue, and backed up rather than moving laterally, a la Jermain Taylor. However, unlike Taylor, Smith was able to land effective punches on Abraham that depleted his energy. Look for this fight to be very similar to the first unless Abraham seriously hurts Smith at any point. It would be easy to predict Smith as the winner, given the pattern in Abraham's defeats, but he will give Abraham enough opportunities to land a big shot. Previewing and breaking down Arthur Abraham vs. Paul Smith II.